Friday, September 8, 2017, is World Physical Therapy Day. The day provides an opportunity for physical therapists all over the world to raise awareness about the crucial contribution the profession makes to keeping people well, mobile, and independent. This year’s theme is “Physical Activity for Life,” highlighting the important role physical therapists play in healthy aging and the aim of minimizing dysfunction and impairment. Exercise is important for our overall health, playing a role in our cardiovascular and musculoskeletal systems. As we age, our structural and functional abilities change and can impair our lives and well-being. Physical therapy, in conjunction with exercise, can aid in healthy, functional aging. Improvements in public health over the past century have led to dramatic increases in life expectancy, largely in part to an increase in exercise. 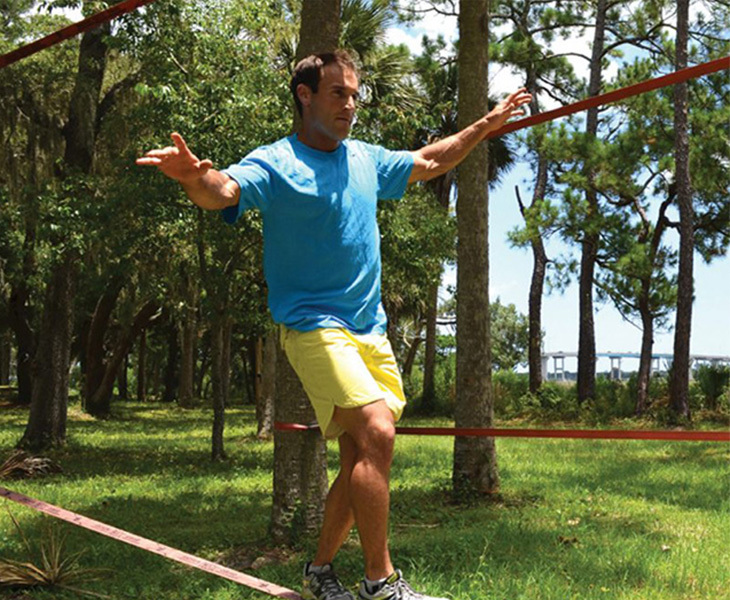 Todd Bourgeois, PT, DPT, OCS, MTC, FAAOMPT, is an assistant professor of physical therapy at the University of St. Augustine for Health Sciences, a practicing physical therapist, and an American Ninja Warrior! He knows how important exercise is, and in honor of World Physical Therapy Day, Dr. Bourgeois is sharing some quick workout tips for sneaking “circuit blasts” into your day. This workout is a fast and effective way to increase the strength, power, and endurance of your arms, core, and legs. It is a total body circuit workout and one of Dr. Bourgeois’ most recommended workouts for individuals who want a quick, highly-effective, and balanced routine. Ready to get started? Follow the workout descriptions below. Please remember to adjust to your individual capabilities. One round is equal to a 10 minute set, with a timer set at 20 seconds on and 30 seconds off. Beginners complete one round, intermediate aim for two rounds, and if you’re feeling advanced, go for three rounds! This workout can be done solo, but a workout buddy can make it even better! Mark a starting line and then another line 20 yards away (just step it off with 20 slightly oversized steps). Every movement starts at the starting line. Start your timer and perform the first calisthenics movement (i.e., 20 seconds on). With a timer there is no need to count reps, just do as many as you can within the allotted time, but pace yourself! Once that time is up you will immediately get up as fast as you can in sprints with proper mechanics to the 20-yard line, slow down gradually (do not try to stop right after the line! ), then turn around and jog or skip back to the starting line (i.e., You’ve got 30 seconds to make the sprint and get back to the starting line). When you get back to the starting line, wait for the timer to beep to begin the next calisthenics exercise. Push-ups – Beginners can do a modified push-up (weight is on your knees instead of your feet), and higher levels can modify the positions of their hands to work different muscle ranges. Crunches – Lie on your back with your hips and knees flexed to 90°, crunch just high enough to lift your shoulder blades off the ground. Military squats – Stand with your arms horizontally straight out in front of you. Bend your knees and hips as if you were going to sit in a chair (approximately 90° of knee bending). Side bridges – Perform a bridge on your side with only your feet and bottom hand touching the ground. Now lower your hip to the ground and then lift it back up and repeat. For this movement, you will need to do both sides (i.e., 20 seconds on the right side and 20 seconds on the left side). Bridges or single leg bridge – Lying on your back with your knees bent and feet flat on the ground, lift your hips in the air until your back and thighs are in a straight line. You can advance this movement by doing this on a single leg (20 seconds on the right and 20 seconds on the left). Push-up claps – Regular push-ups but with quick explosions so you can clap with both hands at the top of the push-up. If you are unable to do this, try it with a modified push-up (put your weight on your knees and not your feet). L over’s – Lie on your back and bend both of your hips keeping your knees straight (now you look like an “L”). Lower your legs to the right, then back to center, then to the left, and then back to center, repeat. Try to keep both of your shoulders flat on the ground. Dips – Lying face up with only your feet and hands touching the ground, move your elbows back and forth as if doing it push-up upside down (not recommended if there are any shoulder issues). This is another movement that is great with a workout buddy! Low-level bicycles– Lying on your back, try to flatten your lumbar spine to the ground. Then perform a cycling motion with the legs approximately 1 to 2 feet off the ground with your feet. Single-leg squat – Same as military squat except one leg at a time. You may not want to go as low with this squat.